One thing that hasn’t changed, however, is the Department’s commitment to excellence. Sweet Maladies, an award-winning play based on Jean Genet’s The Maids, centers on three sisters who, having served on a plantation their entire lives, find themselves uncertain as to how to leave following the Emancipation Proclamation. Faculty began the work of attracting new students by undertaking a major curriculum revision. The program now includes courses on Asian and Asian American theater and Black theater. Work by diverse artists was incorporated into the program’s repertoire. The department recently staged the Pulitzer Prize-winning 365 Days/365 Ways by Suzan-Lori Parks. This 14-person play was the first work by an African American playwright to be presented on Augsburg’s main stage and was chosen because it calls for a multi-racial cast. The department also has welcomed guest directors from many backgrounds, including Rick Shiomi, co-founder of Mu Performing Arts, a company that produces work inspired by the Asian American experience. Shiomi, a winner of the 2012 Ivey Award for Lifetime Achievement, worked in 2011 with Asian and Asian American students to stage an original production at Augsburg titled Inside Out. Sweet Maladies guest director, Dominic Taylor, is associated with Penumbra Theatre, one of only three professional African American theaters in the nation to offer a full season of performances. Penumbra uses the stage to increase awareness of the contributions of African Americans to the theater world. “With our goal to intentionally create welcoming opportunities for our students, it’s important that we invite to our program directors, designers, actors, and playwrights who represent some kind of diversity—whether it is diversity of culture, ethnicity, gender identity, sexual orientation, class, religion, or race,” Engen said. Engen said the department is currently working with Emiliano Chagil, Augsburg’s director of Hispanic/Latino student services, and Micheal Kidd, associate professor of languages and cross cultural studies, to produce a translation of The House of Bernarda Alba, a work by the Spanish dramatist Federico Garcia Lorca. The department’s work is central to Augsburg’s commitment to intentional diversity. 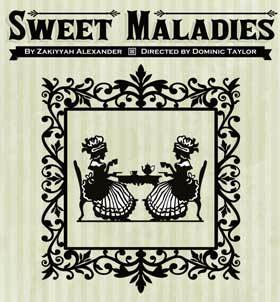 Sweet Maladies features a cast of four women: the mistress of the plantation house played by Mawrgyn Roper ’15, and the three sisters played by Naava Johnson ’15, Leah Tillman ’13, and Jasmine Gilbert ’13. Johnson, who plays the middle sister, Cecile, said being involved in her first theater production at Augsburg, learning how to memorize lines and to move on the stage has been challenging. Taylor, though, has taught her how to relate her character’s experiences to her own so her acting is more realistic. “When you start getting into the scene, that’s when you know you’re playing the character right,” she said. The play, set in 1865, tells the story of sisters who worked as slaves on a plantation. Recently freed, the girls remain in the house because they are unsure how to begin new lives in the Reconstruction Era South. Tillman, who was involved in the 2012 Augsburg student-led production of Debt, plays the role of Polly, the eldest sister. Tillman said that playing a character from this time in history has been emotionally demanding. Tillman said that for her, Sweet Maladies is an important play because it addresses a significant point in the United States’ history and the message is relevant to today’s audiences. February 8, 9, 14, 15, 16 at 7 p.m.
February 10, 17 at 3 p.m.